I met Ryan Crappa during our time as writers for Tru School Sports. Recently, Ryan announced he was starting Puck Planet, a site which would be dedicated to hockey. He got a few writers from TSS on board, along with some new writers. Ryan approached me, but I didn't think I would be able to contribute daily (or enough to satisfy the needs). Fortunately, Ryan was fine with my limited commitment and I agreed to contribute a few times a month at the least. I would be covering the Rockford IceHogs, along with writing an occasional feature piece on some hockey topic. I am really excited about this site and writing for it. I think Puck Planet has a bright future. Ryan has the enthusiasm, knowledge and patience needed to run the site. The writers already on board are all talented and dedicated. I'm looking forward to watching it all develop and grow. 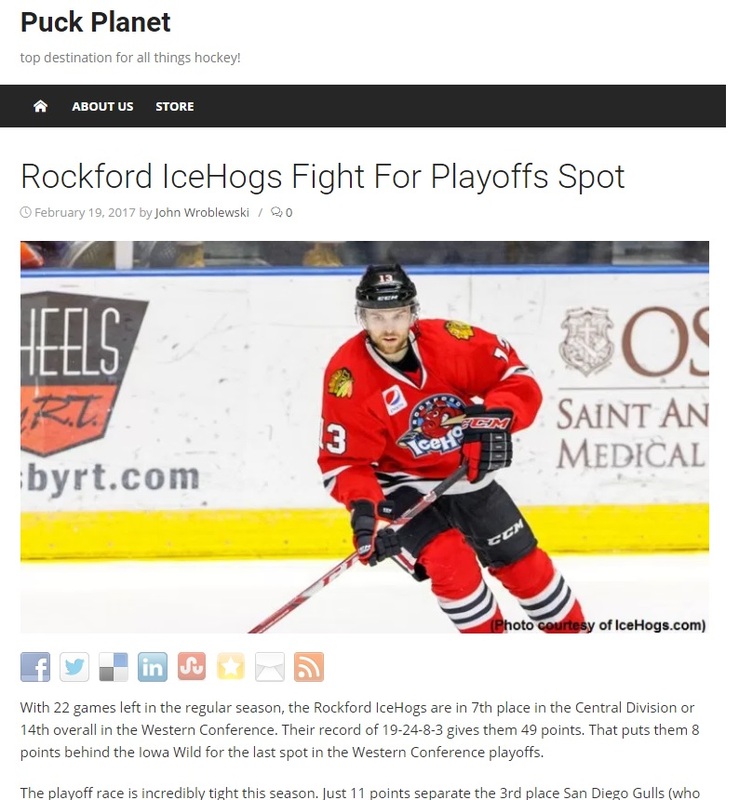 My first piece for Puck Planet is Rockford IceHogs Fight For Playoffs Spot. Please check it out and return often to PuckPlanet.com, your top destination for all things hockey!